Almonds are one of my favourite foods (alongside coconut oil, cheese, chocolate, steak, nectarines…). 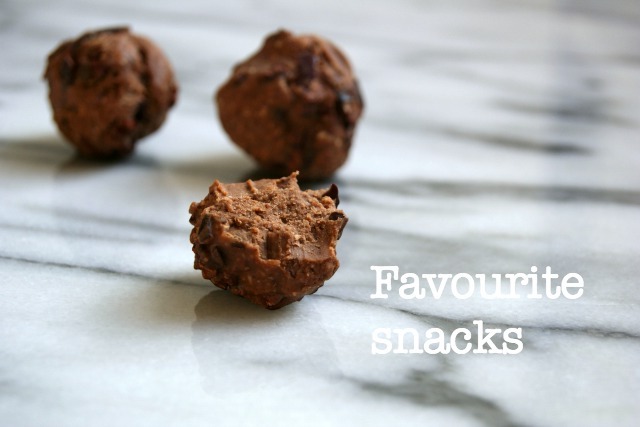 I didn’t actually realise quite how much I loved them, until I went to write a post about my favourite snacks and found myself explaining why they all contained almonds. So hell, here we have that post, now transformed into my favourite almond based edible stuff. My current favourite are Bliss Balls. They’re also a favourite of everyone I’ve offered them to. Even people who have initially tried them and said they weren’t keen on nuts, have asked me for the recipe the next day. It’s like they get in your brain or something. These were originally made from Hemsley and Hemsley’s recipe for Tahini Bliss Balls (mixing creamed coconut, tahini, raw honey, a little sea salt and cacao powder for a chocolate version) and has evolved into being made with whatever is in the the cupboard. Usually that means I replace the tahini with almond butter as I buy that in bulk and could probably supply most people I know for the next year, should the need occur. I’m ready people, I’M READY. Adding chopped nuts instead of cacao nibs works too, as well as sneaking in maca powder. They keep in the fridge for ages or even better, I make about 20 and keep them in the freezer until I need them. They’re packed with protein and a good amount of fat so they keep me full for ages. I generally reserve these for days when I’m very active or I’m about to exercise. Up until I discovered Bliss Balls, this was my hands down favourite snack ever (even more than a Krispy Kreme). Natural almond butter is perfect with crisp apple to cut through the cloying texture of nut butter. If I’m at home, then I’d get all fancy and chop the apple up to dip in the almond butter. When I’m out, I’m a lot less fancy and I’ll just eat the almond butter with a spoon and have the apple at the same time. Other excellent alternatives are the original peanut butter and banana, made into little mini sandwiches. Plain old almonds. I usually have a pot of almonds somewhere in my bag. I’m a bit like the crazy nut lady. A pot of almonds will fill me up and I can sneakily eat them in locations where crunching on an apple and spooning my almond butter into my mouth may be frowned up. Sometimes sneaky snacks are needed. Although I have learnt to have water around when I eat almonds straight. Too many times have I been caught out by an almond consumption related coughing fit. They can be tickly little blighters. To add to my love of almonds, they’re also really good for you. They’re full of vitamin E for supporting your skin, calcium to protect your bones and the skin is packed with heart friendly flavonoids so my rotation of snacks is doing the world of good.